Vlase Nikoleski is a Macedonian-born artist who makes multimedia sculptures which incorporate water, steam, sound and traditional sculpture materials. His career in fine art media spans over four decades and his evocative and narrative sculpture displays technical brilliance which derives from his passionate love of three-dimensional media. 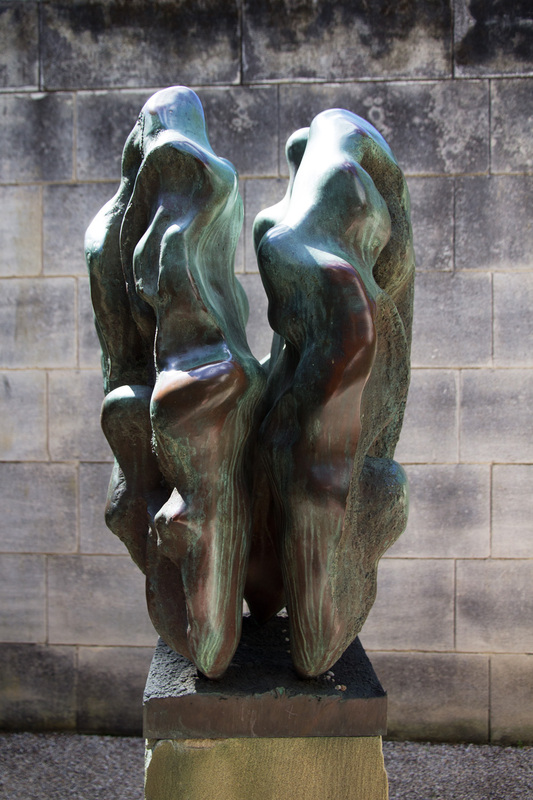 His works first came to prominence in Australia in the early 70’s with a series of modernist sculptures, which were marked by a rigorous abstract purity, elegant simplicity and complete control of technical means (Nikoleski, 2014). 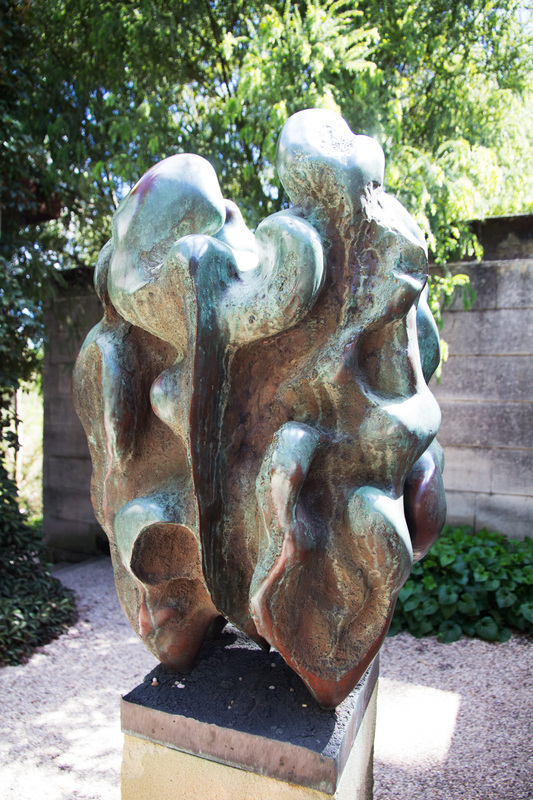 The Seed —Accumulation is a bronze sculpture nestled in one of the outdoor nooks and crannies of the minimalistic Heide II house, designed as a ‘a gallery to be lived in’, built from white Mount Gambier limestone that would weather with time to itself become a living sculpture within the landscapes of Heide. 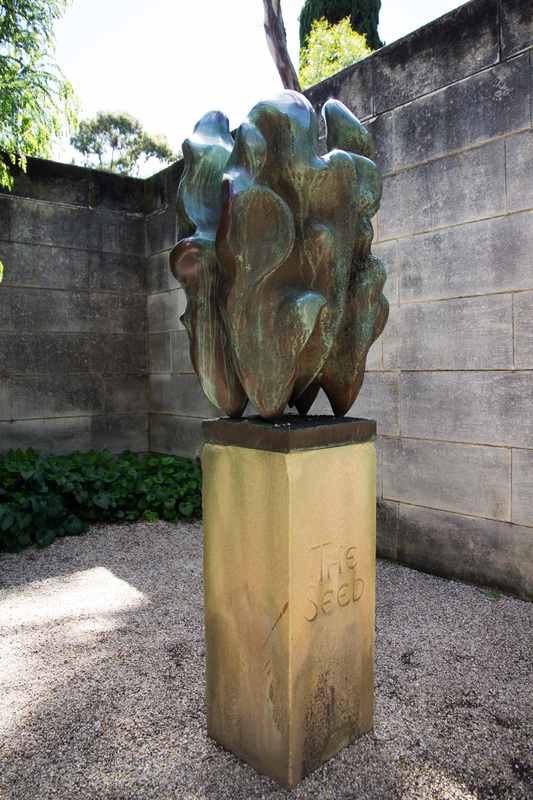 The Seed is sitting on a purpose-built sandstone base, inscribed with the title and artist’s name. The artwork invites us to enter the private and intimate world of the artist who through aesthetic and associative realms is lobbying for environmental sustainability. The scale of the work and its finely rendered surface take the sculptural object beyond being merely a depiction of a ‘walnut’ — the sculpture presents a typically static, balanced and proportioned — classical object — challenging the ways we view indigenous and introduced (non-indigenous) flora, drawing attention to the impact and influence of colonisation and European settlement on the indigenous environment (Heide Museum of Modern Art, n.d.). What is the first thing about this sculpture that you observed? How do you feel about this sculpture, what is your subjective reaction to it – like/dislike? Own your subjectivity. How would you objectively (with great detail) describe this sculpture to a friend on the phone? What do you value about this sculpture, what does this sculpture make you appreciate? How does this sculpture challenge your perceptions and raise your awareness of environmental/sustainability issues? Can you name some other artists who through their work also lobby for environmental issues?